In case you haven't heard of the brand Acure Organics before, they offer natural and organic skincare and haircare products to help you feel your very best- natural! They recently sent me a few samples to try their line and I am psyched about everything I have used already. Mint and Echinacea Stem Cell Shampoo & Conditioner for fine, limp hair- loved how invigorating my hair felt during the wash and loved how it looked and felt afterward. Wasn't oily and felt good and conditioned afterward. Advanced triple moisture system Body Lotion- already loving how my skin felt after the shower with the body wash, the lotion reinforced it. I particularly used this for my legs that get dry easily. Oil control facial moisturizer- I adore this light-weight moisturizer especially for the summer. It provided me enough moisture on my face so it didn't feel too dry in the Cali heat as well as enough oil control for my oily/combo skin. Winner!! radical resurfacing treatment- this serum was a nice nighttime "treatment" for my skin. Have not been using too many skincare products in the evening lately so this felt comfortable to use. My skin felt smooth and nourished after use. Argan Oil- a staple oil that I believe everyone should have in their beauty closet- this was very similar to other Argan oils I have tried before. Perfect to use in lieu of or additional to a moisturize. 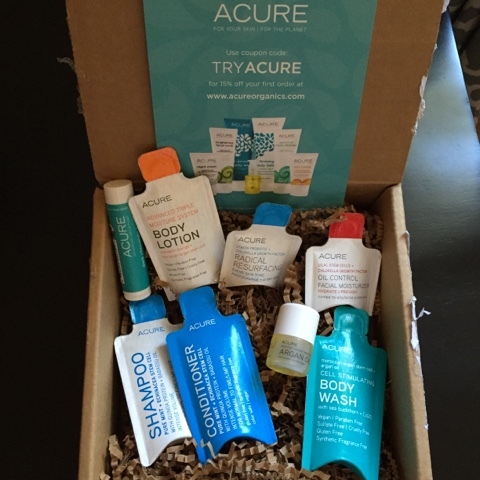 Thanks to Acure Organics for letting me sample these goodies! Looking forward to trying more of your other products to incorporate into my skin and body care routine!